Looking forward to Rome In A Day's next performance nearby at the Grill on July 10. 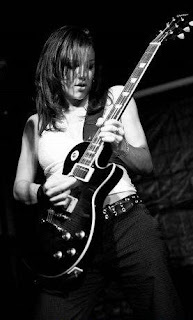 The gorgeous and talented guitarist Ali DiPippo is alone worth the trip out. Their name is meant as "a satire, intended to convey the point that in an industry where there is such a focus on instant gratification, great things still take time, patience, dedication and, most of all, hard work. " This was as close as I got to Tristan tonight. Turns out she is more popular than I anticipated, as the show as sold out before I arrived. 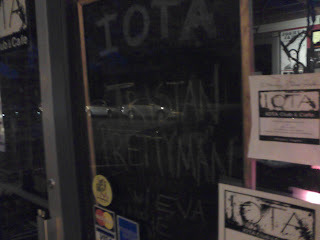 It didn't help that I only live a minute away from Iota where she was playing so I thought I could just walk in at 9pm. Sadly I think Tristan is getting too big for little Iota, as her sales have skyrocketed since her song "Madly" was featured on "The Hills." I heard that she was the number three download on iTunes a couple months back. 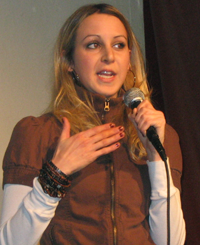 Made my second appearance at RiRa's open mic standup show named "HaHa." The comedy seemed a little darker and dirtier than last time, which wasn't the best of luck for me since I brought my Dad this time =P Although veterans like Lisa Fine and Roger Mursick made solid performances. Tomorrow night at the Grill a friend of mine is having a charity event to benefit the Alzheimer's Association. Besides a raffle, there will be a date auction featuring some of Arlington's finest singles, with 100% of the proceeds going towards Alzheimer's research. I completely missed the flash mob at Eleventh last week. The online organized spontaneous event was designed to promote their new policy of going smokeless. Thanks to this new rule I didn't smell like cigarettes Saturday night, so I wish I had participated. Thanks to What's Up Arlington for keeping me informed of local events like this. Also, looking forward to the Tristan Prettyman make-up show at Iota on the 27th! When it started raining Saturday night I was afraid that the evening might be washed out, but the rain just cooled the streets off just enough to make it perfect bar hopping weather. We hit up Eleventh first. This trendy and slightly more upscale lounge attracted a good size crowd of party goers throughout the night. The upstairs bar and the downstairs VIP room alternated between being very packed to being sparsely occupied. Stephen Patrick mixed electronic/techno styles of dance music throughout the night. His beats were energetic enough to convince more than one of the females to groove to the music. Mister Days also proved to be worthwhile, even though I don't care much for that types of drunken and drama-causing stupid people that scene attracts. Someone got a little bored working at the CVS on 10th and Washington Blvd today. 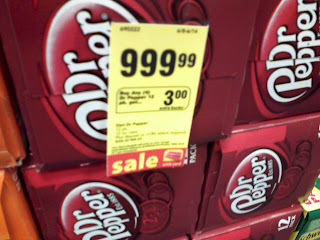 Guess playing with the pricing gun kills some time. And makes for a good photo op. 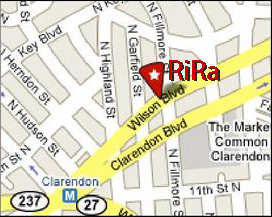 Very happy I made it out to RiRa's open mic stand up comedy tonight. 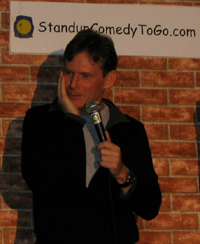 They feature professional and amateur comedians every Wednesday night in the upstairs party room. The small room was packed, but that didn't deter the diligent waitress Sarah from coming by frequently to check on everyone. I wasn't expecting much since it was a free event, so I was very surprised at the quality of comedians that took the stage. Tonight featured Lisa Fine, Roger Mursick, Jared, James Ryan, and Dan Nainan (sorry I can't remember all their names). Definitely worth checking out next week. At the end of the show someone and said I was really funny on stage. I took the compliment even though he mistook me for Roger (all us Irish guys do look alike).